I hope you are all doing well! It has been quite eventful and I am going to cover a few things in this entry. On my adventure blog, I wrote about my experience at New York Comic Con 2015. It was my first time there and thought that it was an incredible experience. I give a lot of props to those of you who cosplay. It is hard work, and I think it’s great to see how talented these individuals are. It was also nice to see people be themselves and enjoy their time there. I put up the Calculus 2 handouts this past weekend and one on Monday. There is a lot of information in the handouts, but I will put up an abridged version here. You can read my complete set of notes in the link at the end of the entry. The handouts cover indefinite integrals (antiderivatives), basic integration rules, and linear motion problems. Those of you already know my background by now and can see that I love modeling and word problems! It was fun revisiting my notes and updating them. I reworded my quiz questions and turned them into problems you can review (or will encounter in your studies). If you need a refresher on basic integration rules, read Handout 1.1A first and then proceed to 1.1 (main handout) and 1.1B (applied problems). In this handout, I will do a quick review of basic integration, its applications to linear motion problems, and an introduction to differential equations and solving initial value problems. I will put Handout 1.1 here and a problem from 1.1B, the kinematics handout. There are a total of 3 handouts for this topic. My plan next for the Calc 2 handouts will be a review of Riemann Sums and Definite Integrals. Let’s begin with a review of a few concepts regarding indefinite integration (or antidifferentiation. Suppose we have the function F(x) = x5. Through the Power Rule in differentiation, we find the function’s derivative: f(x) = 5x4. As a result, we note that the function G(x) = x5 + C is the General Antiderivative of the function f(x) = 5x4. C represents the constant of integration. The function G(x) = x5 + C represents the family of antiderivatives for our function f(x) = 5x4. We can observe several members of this family highlighted above where C can represent -0.01, e, 10 or -473. Differentiation and integration are inverse processes of each other. You can differentiate your answer to check your solution. Evaluate the antiderivative (indefinite integral) and verify your solution through differentiation. This is a polynomial function and we just need to use our integration rules to integrate it. Step 1: Rewrite our original integral. Step 2: Apply the Power Rule for Integration and the Constant Multiple Rule. Step 4: Differentiate our result for verification. Now we can differentiate to verify our result. Now let’s try an example involving trigonometric functions. Step 1: Rewrite the integrand. In this case, we can write them as products. Step 2: Simplify further using trigonometric identities. From here, we have the simplified version of the integrand. We can expand it further to get the original integral in the problem. We’re going to briefly touch on differential equations since we will be covering them in the next section when solving initial value problems. Courses later on will go more in depth on ordinary and partial differential equations. denotes the derivative of the function y with respect to x. As you already noticed, the differential form is what we use throughout integration. To get , just find the derivative of the function. *If you remember what we discussed earlier where , you will also see the differential expressed as . We previously learned that there are many solutions to with each solution having different constants. Since it is the constants that differ for the antiderivatives of f(x), we can observe that each antiderivative is a vertical translation of each other. For example, in our example above we can graph a few of the antiderivatives for and observe a few of its solutions. A few values of C included here are 2.5, -2.5, 5, and -5. The general solution shows us the antiderivatives for 5x4 and how these antiderivatives and their different integer values for C can be a solution to the given differential equation, . We will now learn how to find a particular solution. In order to find a particular solution, we will need to know the initial condition. The initial condition provides the information for one specific value of x for y = F(x). 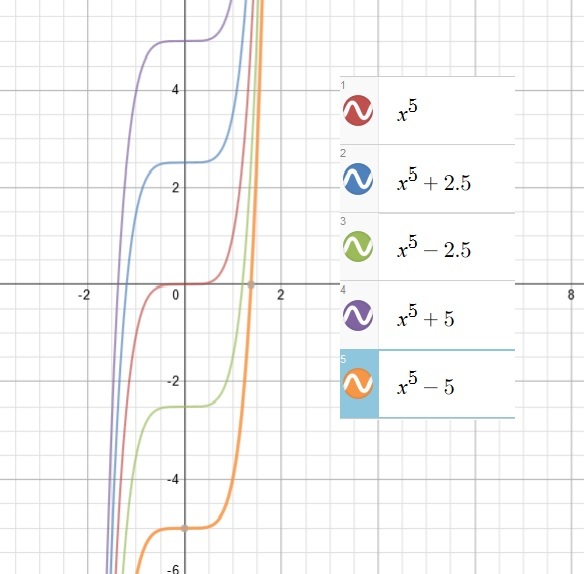 In our above graph, we can observe several values for C. With the initial condition, we can find which value of C inputted into the particular solution passes through the point (x, y). With the information from the general solution and the initial condition, we can find the particular solution. This type of problem is called an initial value problem. Let’s take a look at an example so that we can visualize this. Find the general solution of F’(x) = 2x + 3 and determine the particular solution that satisfies the initial condition F(3) = 9. Step 1: Find the general solution. We begin with F’(x) which we previously learned is the derivative of F(x). In order to find the general solution, we have to integrate F’(x) to get F(x). This is our general solution. Step 2: Use the initial condition to solve for C.
We are given the initial condition F(3) = 9. We saw that a function can have many antiderivatives. However, we now know that the curve that we are looking for passes through the point (3, 9). The initial condition allows us to pinpoint and find the particular solution. We use the information from our initial condition and apply it to our general solution to solve for C.
Step 3: Determine the particular solution. Now that we’ve obtained C, we can determine the particular solution that satisfies the initial condition. The particular solution that satisfies the initial condition F(3) = 9 is F(x) = x2 + 3x – 9. Solve the following initial value problems. Similar to above, we have to find the general solution, utilize our initial condition, and find the particular solution that satisfies the initial condition. Step 1: Integrate the derivative to get the general solution. Similar to our previous example, we use the information from the initial condition to solve for C.
The particular solution that satisfies the initial condition F(3) = 20 is . If you want to factor it out you can write it as . When we solve this initial value problem, we have to perform an additional step since we are given the second derivative, (unlike in our previous example where we began with ). Step 1: Integrate the second derivative to get . Step 2: Use the initial condition and solve for C.
We can now plug in C to get . Step 3: Perform the same steps to get the general solution. Now that we have , we can integrate it to get . Use the initial condition and solve for C.
The particular solution is . Here is one of the applied math problems from Handout 1.1B. More thorough explanations regarding position, velocity, and acceleration along with different types of problems are in the pdf version of the Handout. A model rocket was launched upward from an initial height of 112 feet with an initial velocity of 96 feet per second. The acceleration due to gravity is given by a(t) = -32 feet per second per second. Neglect air resistance. a) Find the position function s(t) expressing height s as a function of time t.
b) How long will it take the rocket to reach the ground? Let’s begin with part a and find the position function. Step 1: Organize the known information. We know that a(t) = -32 ft/s2. The initial height, s0 is 112 feet. The initial velocity, v0 is 96 feet per second. Step 2: Integrate the acceleration function to get the velocity function. We learned in differentiation that acceleration is or . By integrating , we can get . To get the velocity function, we integrate . The initial velocity at t = 0 is 96 ft/s. In other words, . We put this into the equation to find C1. Step 3: Integrate the velocity function to find the position function. In our previous step we found the velocity function, . We now integrate the velocity function to get the position function s(t). Similar to the previous step, we find C2 at t = 0. The initial height where the rocket was launched is 112 feet. We put C2 into s(t) to get the position function. Now that we found the position function we can now calculate when the rocket hits the ground. To find the time when the rocket hits the ground, let s(t) = 0 and solve for t.
Since time is positive (t ≥ 0) in this case, the rocket hits the ground 7 seconds after it is launched. Hope you are all well. The weather is getting cooler and it’s almost the end of the year. I can’t believe how fast time flies! Just to let all of you know, the Powerpoint for Chapter 3 is now open to the public. You can download them on my site. Chapter 3 can be reviewed together with Handouts 1.5 and 1.6. In the United States, healthcare organizations and institutions undergo accreditation in order to maintain high standards of medical care to the public. Accreditation is a voluntary process where an agency is requested to perform an evaluation of these healthcare organizations and institutions (such as hospitals and nursing homes) and ensure that they are compliant with maintaining these standards. The agency will send an objective third party such as the Joint Commission of Accreditation of Healthcare Organizations (JCAHO), an agency established in 1952, who will thoroughly review the policies, procedures, and standards of the organization or institution undergoing accreditation. Accreditation procedures include official members of JCAHO performing an onsite inspection where they survey the organization or institution. According to JCAHO’s current guidelines (as of 2015), healthcare institutions are surveyed triennially (every three years) and laboratories are surveyed biennially (every two years). During this survey, the JCAHO team (composed of trained healthcare professionals including doctors, nurses, and medical researchers) visits the site unannounced. During the onsite inspection, the team will check to ensure that the organization and its employees are exhibiting the highest professional standards when caring for patients as well as adhering to quality control standards. JCAHO ensures that organizations and institutions such as clinical laboratories, hospitals, managed care organizations, and psychiatric facilities are compliant with these quality assurance standards. If an organization or institution successfully passes the accreditation process, the organization or institution can display their accreditation status by JCAHO. If an institution loses its accreditation status, they won’t be able to provide services for patients under Medicare. Confidentiality refers to maintaining the privacy of any information related to a person and not disclosing the information to a third party without the person’s informed consent. Congress passed a law called the Medical Patients Rights Act which provides patients with rights to have their information protected as well as having their records handled confidentially by healthcare professionals. Information can include whether the person is a patient of an institution, their medical history, and results of tests and procedures (such as a mammogram or HIV testing). Even before recent centuries, medical confidentiality was discussed ages ago under the Hippocratic Oath. A patient’s information cannot be shared over the phone or given to another individual (such as another healthcare professional) unless permission (written or verbal) is given by the patient to do so. Information provided to caretakers of the patient (e.g. family or friends) must be relevant to the patient’s current condition and situation. According to the U.S. Department of Health and Human Services, medical records can be requested through a court order by a judge. The physician or medical records custodian may only disclose information that is specifically requested in the court order. The statute of limitations refers to the period of time that a patient has in order to file a lawsuit. Each state has its own laws regarding the time limit, but the range is usually between one to three years. There are a few crimes which have no statute of limitations. These are usually serious crimes which may result in a life sentence in prison. Murder is one of these crimes. The statute of limitations places this limit so that plaintiffs can file a lawsuit in a timely manner and defendants won’t be surprised by a lawsuit from an incident that occurred several years in the past. This also allows witnesses to be reachable/available while the case is current. The discovery rule is the legal theory that describes how the statute of limitations begins to run at the time the injury is discovered or when the patient should have been aware of the injury. For example, if a physician performs a procedure and the patient notices complications years later, the statute of limitations begins when he or she discovers the complications, not when the procedure took place (assuming that no complications were discovered during that time). Tolling refers to the running of the statute of limitations where the time limit has not expired. In this case, the time limit has been paused or suspended and extends past the one to three year limit. An example would be a minor involved in a medical injury as a result of negligence or malpractice. For example, in many states the statute of limitations starts to run when the victim reaches 18 years of age. If the victim was a minor (below 18 years of age) at the time he or she was injured in a medical incident, he or she can file a lawsuit years after the injury is discovered (when they turn 18). If John was 15 in 2010 when the injury occurred, the statute of limitations starts to run when he turns 18 in 2013. The time limit will then be: the time the minor reaches 18 years of age + the state’s statute of limitations. The court may also appoint a guardian ad litem for a plaintiff who is a minor. A guardian ad litem is an adult guardian appointed by the court to represent a minor or unborn child in the litigation process. The minor can initiate a lawsuit through a guardian ad litem or wait until he or she turns 18 years old. Good Samaritan laws are state laws that help protect healthcare professionals and ordinary citizens from liability while giving emergency care to accident victims. During emergencies, Good Samaritan laws encourage healthcare professionals and lay citizens to provide reasonable skill and care when aiding victims in need during emergency situations. Providing assistance is encouraged, but voluntary in all states except Minnesota and Vermont. For states where it is voluntary for healthcare professionals to provide emergency aid, many professionals consider it as their ethical obligation to assist those in need. It is their own ethical value system that sets the foundation for the care they provide during these emergency situations. In Minnesota and Vermont, individuals who are present at the scene of an emergency situation must provide aid to the individual(s) in need of assistance. These can be found and referenced through Minnesota’s Good Samaritan Law (604A.01) and Vermont’s Good Samaritan Law (Title 12, Chapter 23, SS 519). If an off-duty healthcare professional or citizen does provide care, they must exercise good judgment to provide reasonable care and skill when assisting the victims of the emergency. The person providing the emergency care must not have any intention to receive a reward or any form of compensation. Respondeat superior comes from Latin meaning “let the master answer.” Under this principle, the employer is responsible for their employees’ actions performed in the workplace setting. In this setting, the employer monitors the employee’s duties and job responsibilities in which any wrongful action performed by an employee falls under this scope. Even if the employer is not at fault, he or she is still liable for his/her employee’s conduct. When the employer delegates a duty to an employee under him/her (e.g. having a nurse or physician assistant administer medication or perform a procedure), the physician is liable for the employee’s actions under the principle of respondeat superior. The physician is responsible for the correct performance of the duties he or she has delegated to his/her staff. Hospitals can also be responsible under this principle. For example, it is a hospital’s duty to have trained staff (e.g. bedside nurses) available to recognize any problems and take appropriate measures (e.g. notifying the physician or nurse supervisor) to reach a solution. Each healthcare professional should notify the next person in charge (chain of command) regarding advice on what necessary actions to take. Failure to respond to problems or emergencies requiring medical attention can lead to the court holding the hospital, physician, nurse, or all parties liable for negligence. Healthcare professionals have a duty to appropriately understand and carry out orders by the physician or employer. Communication plays a key role to ensure the safety of patients when carrying out orders. If the order is unclear, may seem incorrect, or a drug or procedure may harm a patient, the healthcare professional must notify the physician or employer immediately to discuss the issue. Healthcare professionals must work within their scope of practice when performing their responsibilities. Scope of practice refers to the activities a healthcare professional is allowed to perform as indicated in their licensure, certification, and/or training. For example, according to the Board of Nursing, a registered nurse (RN) in New York State can conduct patient assessments and triage while a licensed practical nurse (LPN) cannot since those duties are only within the scope of practice of a registered nurse. Healthcare professionals must understand the scope of their duties and practice within these guidelines. Supervisors such as physicians, pharmacists, and nurse managers are responsible for their healthcare team and must ensure that the team members are performing duties within their scope of practice. As we had discussed at the end of the previous section, the supervisor should discuss the chain of command with the team. This allows the team member to know who to go to when there is an issue to discuss regarding patient care. By having an organized chain of command, healthcare professionals can minimize errors and prevent acting outside of their scope of practice. Employers (such as hospitals) and physicians have a responsibility to maintain a safe work environment for their employees. On the other hand, employees have a responsibility to maintain the safe work environment provided by their employers. Despite taking precautionary measures, accidents and other unpredictable incidents may occur. A few of these include injuries from falling, fires, and theft. Professional liability insurance usually covers injuries and theft which occur within the employer’s workplace environment. Employers may also bond employees who handle finances. Bonding is a special type of insurance that covers employees who handle financial statements, records, and cash. In the event that an employee steals money from the employer, the employer can recover any losses up to the amount the bond covers. Risk management identifies any key problems within an organization or structure and develops a plan to address these problems. Risk management is defined as the practice to minimize the incidence of problem behaviors which might result in injury to the patient and liability for the organization. Factors examined in risk management include improper storage of medications such as narcotics, providing inadequate or unsafe care to patients, lack of security, and environmental issues such as wet floors and improperly grounding electrical equipment. Risk management plays an important role to maintain the safety of patients and the work environment as well as reduce behaviors which may result in a medical malpractice lawsuit. Employers maintain updated versions of policies and procedures detailing resolutions to previous risk incidents. Employees are encouraged to familiarize themselves with these resolutions in the event that they encounter these risk factors. Incident reports are used to document any problems or errors in a hospital, nursing home, and other medical facilities. Any employee can fill out an incident report to document problems which they have witnessed. Incidents may include errors in administering medication (e.g. giving the patient an incorrect dosage or administering the incorrect drug) and patient injuries (e.g. falls and cuts). Incident reports document what adverse event had occurred, when it had occurred, and any actions that were taken regarding the adverse event. These reports are also important in preventing future accidents.